There are some pieces of golf equipment that tend to get most of the attention when the average player goes shopping for new gear. The clubs you are going to use, of course, get a lot of attention as you shop. Your bag is another purchase that is carefully considered as well, as are your shoes. However, while a significant amount of research and planning goes into many of those purchases, the story is different when it comes to golf gloves. For many players, the glove on their hand is simply the one that was sitting closest to the register in the pro shop while paying greens fees for the day. While it might seem like all golf gloves are more or less the same, the truth is quite a different story. There are major differences between golf glove models, as this is another area of the game where you get what you pay for. A cheap golf glove might save you a few bucks, but it is unlikely to last more than a round or two, and it won’t feel great on your hand as you swing. By spending more, however, you will be able to use a glove that is comfortable, durable, and actually helps you play better golf. 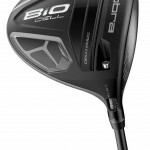 If you are at all serious about your golf game, this is one purchase that you will not base on finding the lowest possible price. There isn’t much nice that you can say about cheap golf gloves, as they bring nearly nothing to the table but the ability to soak up a little bit of sweat. To make sure your glove is actually helping you to play at a higher level, spend the extra money on a good glove from a respected brand. Considering the fact that the difference between a cheap glove and a good one is usually no more than $10 – $15, opting for the quality product should be an easy choice. For the most part, you want to be looking for a leather golf glove when you shop for this important accessory. The feel of leather is something that simply can’t be replicated with synthetic materials, so you are sure to appreciate the way the club rests in your hands when a leather glove is between you and the grip. Professional golfers almost universally use leather gloves when they play, and you should be following their lead. Not sure where to start when looking for a good golf glove? Don’t worry – we’ve got you covered. Check out the options below for a sample of what is available on the market today. 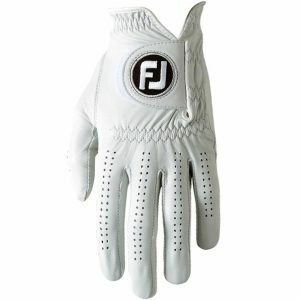 FootJoy, in addition to making quality golf shoes, also is one of the leaders in the golf glove market. This model, the Pure Touch Limited Edition, just might be the best in their line. Sure, it is one of the most expensive golf gloves you can purchase, but the quality of this glove will be evident as soon as you slip it on your hand. With wonderfully soft leather and reliable construction, you can trust this glove to help you keep a firm grip on the club as you swing. As is the case with all quality leather gloves, this item will last longer if you take it off of your hand in between shots. Sweat and oils from your hand will deteriorate the condition of the leather, so put it in your pocket while you walk to get the most from your investment. 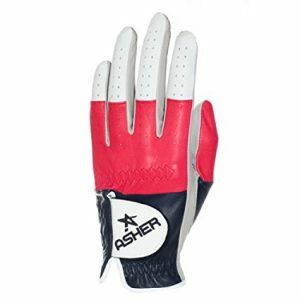 If you would like to make a style statement while out on the golf course, this next glove from Asher may be right up your alley. While it is made from the same Cabretta leather as many other gloves on the market, this model features a unique tri-color design with white, red, and black represented. This glove won’t match the tastes of all golfers, but it might be exactly what you need to stand out on the course. In terms of price, this glove matches up nicely with other premium options on the market. As you already know, Ping is one of the most respected and trusted names in the golf business. 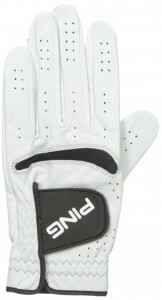 Any item that bears the Ping name is one worth consideration, and that is certainly true of this Sensor Sport golf glove. Some of the high-end features included with this glove are Cabretta leather, pre-curved fingers, a wristband designed to wick away moisture, and ample finger vents to let the glove breathe. Whether you have a club full of Ping equipment or have never before purchased products from this brand, you would be wise to consider their premium glove. As an avid golfer, you are going to need more than one golf glove in your bag at any given time. If you play on a hot day, for instance, you will want to be able to rotate through at least a couple different gloves as they get sweaty. Or, if playing on a rainy day, you need replacements for the gloves that get wet. 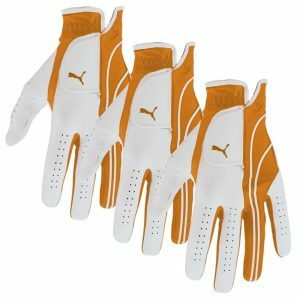 Puma has you covered with this offering, as it is a three-pack of their Formation Performance Men’s Golf Gloves in a striking orange color. These are made from genuine leather, and they come at a lower per-glove price than many other options thanks to the advantage of buying three at a time. Another one of the top names in the golf business, TaylorMade offers a quality golf glove to go along with the rest of their line of high-end goods. This glove is known as the Tour Preferred, and the name pretty much tells you what you need to know about the market for this item. Made from leather and also including a moisture wicking wristband, you are sure to be impressed with the quality of this glove. Unlike some of the other gloves we have listed, which have unique design elements, this is a basic white glove with a small, black logo.